This error occurs when CloudExtend is not able to retrieve the message details, particularly when you reply to a message inline and hit the "Celigo send button". 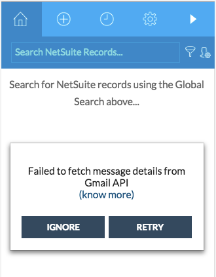 In normal scenarios, once the message is sent using the Celigo send button, CloudExtend automatically fetches the NetSuite records matching the Sender/Contextual details of the message. However in this error scenario, it is not able to fetch the message details from Gmail and throws this error. Try the retry option provided in the pop up and see if it retrieves the message details and in turn Sender/Contextual details. If the error still persists, navigate to a different email and come back to the mail to attach it to a record. You can quickly navigate between mails by using the next/previous message navigation arrows as shown below.